New York markets are an affordable alternative to regular grocery shopping. Therefore, many New Yorkers often shop at the variety of markets around the city. The produce is often fresher and much cheaper. In addition, grocery shopping at a market is a nice way to relax. 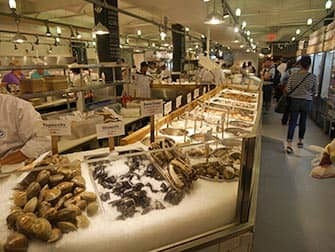 Visiting one of the New York Markets is a fun and free way to enjoy the atmosphere and taste the local produce. 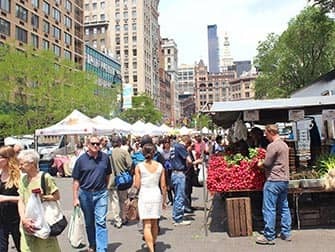 The Union Square Greenmarket takes place every Monday, Wednesday, Friday and Saturday on the North and East side of Union Square. Between 08:00 and 18:00, you can find a wide variety of fresh products from local farmers and producers. Take subway lines 4, 5, 6, N or R to 14th Street/Union Square and you can’t miss the white tents. The market has a very organic feel (some stalls even use solar panels). Don’t expect to only find farmers here: it has become a trendy pastime to come here, shop and see and be seen. There are between 80 and 140 stalls, mostly selling fruit and vegetables. 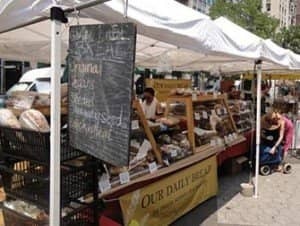 The Union Square Greenmarket is also the perfect place to buy fresh bread and pastries. How about some apple/cinnamon muffins or a blueberry pie? The market is also known for its fine selection of flowers and plants. You can also find more specific organic products like honey, maple syrup and lavender here. Eric’s Tip: Visit the market preferably on a weekday as on Saturdays it is usually very busy. 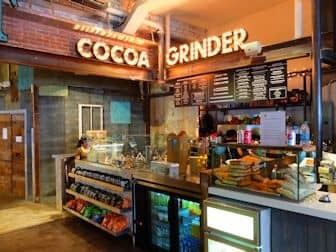 Chelsea Market is a covered market in the Meatpacking District, located in a former industrial site on 9th Avenue (between 15th and 16th Street, take subway lines A, C, or E to 14th Street/8th Avenue). 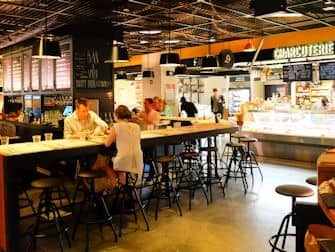 Not only a perfect spot for food shopping, but also to have a bite to eat. Head to Amy’s Bread for delicious sandwiches, muffins and cupcakes. At Friedman’s Lunch you can sit at the high tables and enjoy real American comfort food such as burgers, chilli or macaroni and cheese. Chelsea Thai is a great spot for a quick lunch: they prepare the food right in front of you. If you’re not hungry, Chelsea Market is also a great place to buy books, cooking utensils and Oriental trinkets. Eric’s Tip: Do you like sushi? You can also eat delicious sushi here! 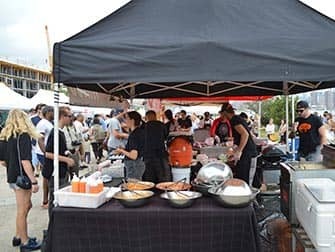 Smorgasburg is a hip food fair of Brooklyn Flea and very popular among locals and foodies. 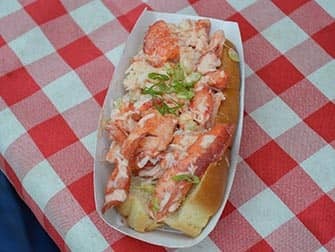 Smorgasburg is a foodie’s dream come true: over a 100 vendors selling and preparing food with international influences. Don’t eat before you go there because you don’t want to miss out on all the flavours. Here you’ll find dishes like all-beef ramen burger, fried anchovies with smoked paprika aioli, peach chamomile honey popsicle, and watermelon, eggplant and ricotta sandwiches. And if you can’t get enough, you can always buy some delicious jams, mayonnaise and sauces to take home. The two summer locations of Smorgasburg are Williamsburg and Prospect Park in Brooklyn. In the winter the market is located at Skylight One Hanson in Fort Greene. Eric’s Tip: Smorgasburg has several locations but I personally like the atmosphere in Williamsburg Smorgasburg best. 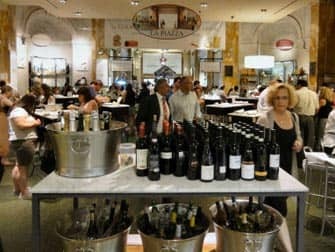 Eataly is an ode to the Italian kitchen. Since its opening, in 2010 by master chef Mario Batali, it’s been busy every single day. 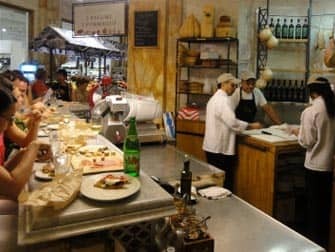 Located on 200 Fifth Avenue (between 23rd and 24th Street, subway stop 23rd Street) Eataly offers, to name a few, a market, espresso bars, a gelato shop, bars, a liquor store, a shop for cook books and cooking utensils, a cooking school and various restaurants. You can get anything in Eataly: from whole fish to fresh mozzarella and imported Parma ham. The restaurants and bars, each specialising in different ingredients, offer a wide selection of Italian dishes. Unfortunately, these dishes aren’t cheap. A platter with a selection of cold meats is available from $11, and a glass of wine will set you back at least $7. For a main dish or a bottle of wine, expect to pay a premium. The best way to experience Eataly is to sample the espresso, order an ice cream (one of the top 10 in New York!) or have an afternoon drink. Eric’s Tip: Would you like to dine in one of the restaurants, then make sure you are on time (especially before half past six in the evening). If you arrive later, you’ll probably have to wait a few hours for a table. Le District in Lower Manhattan, close to the World Trade Center site, could be considered as the French Eataly. Enjoy lovely French cheeses at La Fromagerie, fresh bread at La Boulangerie or macarons at La Pâtisserie, to name a few of the options. 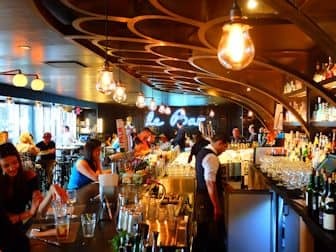 With a cosy bar, several market stands offering French delicacies and three French restaurants it’s the place to be if you’re looking for refined food in New York. 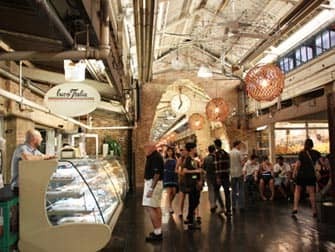 Close to High Line Park and Meatpacking District you’ll find Gansevoort Market. With its concrete floors and brick walls, it’s a hip hot spot for New Yorkers and tourists alike. Multiple eateries have gathered under one roof and there are many options to choose, from macarons and ice cream to lobster rolls and sushi. Gansevoort Market isn’t cheap. Three sushi rolls will easily cost you 18 dollars and you’ll pay up to 3 dollars for a macaron. Nevertheless, it’s a nice spot for a snack or a cup of coffee on your way to one of Meatpacking District’s landmarks. Find your favourite food stall, order some food and enjoy it sitting at a bar or at one of the many tables. 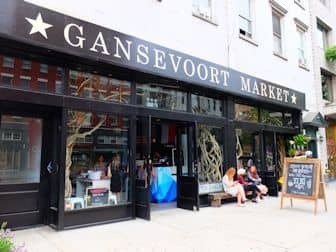 Eric’s Tip: Gansevoort Market has moved to a new location and is now right around the corner from Chelsea Market. It’s nice to check out when you’re nearby, but I like Chelsea Market better as it’s bigger and offers more choices. There are a number of Christmas markets in New York, as part of the Christmas season. From the end of October or early November, you’ll be able to visit a few. However, you’ll get the best experience when all the Christmas lights decorate the city. This happens after Thanksgiving. 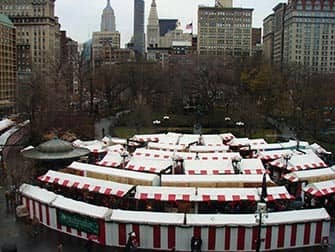 Grand Central and Columbus Circle also have markets but the best ones are at Bryant Park and Union Square. 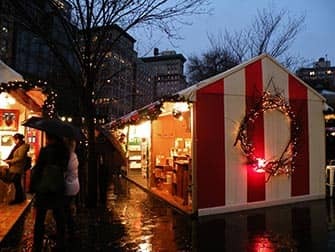 The Union Square Christmas market is a great place to go to if you want to enjoy some Christmas snacks or mulled wine. 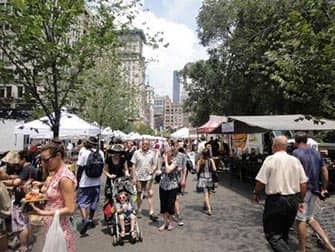 There are over 200 stalls and its location in the middle of Manhattan makes it very accessible. You’ll be able to find a lot of Christmas gifts at this market too. If you’re lucky you might be able to see carollers as well, which will surely set the mood! The Union Square Christmas market dates for 2018 are November 15th until December 24th (closed on Thanksgiving). 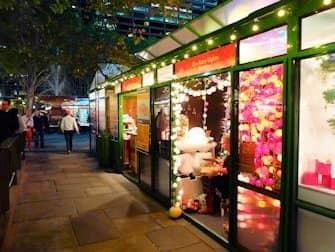 Go to the Bryant Park Christmas market if you really want to have the ultimate Christmas experience. You can go ice skating, drink hot chocolate, enjoy the quaint cottages and of course buy lots of Christmas ornaments. The park has an amazing atmosphere, you can easily spend a couple of hours here. 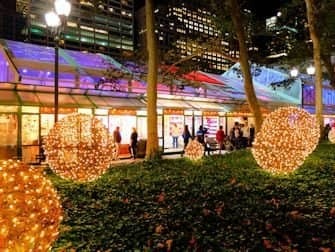 The Bryant Park Christmas Market is from October 27, 2018 through January 2, 2019.